In the bowl of a stand mixer, whisk together yeast, granulated sugar and 1/2 cup warm milk (reserve the 2 teaspoons) until well combined; allow to sit 5 minutes. Add egg, vanilla, salt and 2 tablespoons butter, and mix using a dough hook, until well combined - about 1-2 minutes. Add flour and mix on medium speed for 5 minutes. Remove dough onto a lightly floured surface, and knead for an additional 5 minutes. Shape dough into a ball, place in a greased bowl, lightly cover, and allow to rise in a warm area for 1 1/2 hours. Roll dough out using a rolling pin, into a 13x9-inch rectangle. Spread remaining 2 tablespoons butter over dough. Sprinkle brown sugar, cinnamon, and cereal over dough. Roll up, jellyroll style, and slice very ends off. Slice log into 6 equal pieces, and place in a greased 9-inch cake pan. Lightly cover and allow to rise in a warm area for 45 minutes. Preheat oven to 350 degrees. Brush a little extra melted butter over rolls, if desired. Bake 20-25 minutes or until golden brown and well risen. Remove from oven and cool on a wire rack for 15 minutes. Stir together confectioners' sugar and additional 2 teaspoons milk until combined; drizzle over cinnamon rolls, and serve. 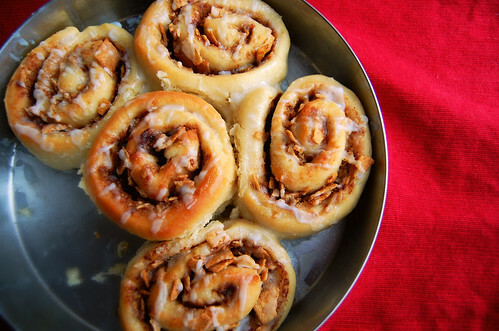 39 comments on "Cinnamon Crunch Cinnamon Rolls"
Wow these are so cute! I'm in high school right now, and although there are no life skills type classes at my school, this is time where my interest in cooking and baking began. 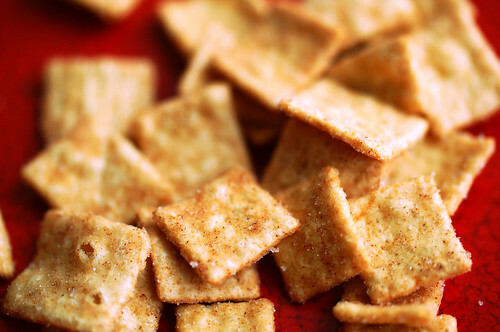 Putting Cinnamon Toast crunch in is such a great idea! I swear you're evil. 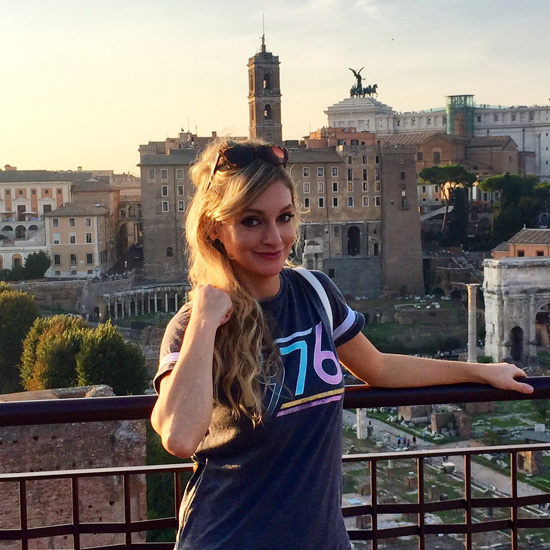 I am so addicted to your blog b/c it all looks so incredible. Even things I wouldn't like look good! Aw, what a cute story about how you caught the baking bug! I agree about not being able to resist when cinnamon toast crunch is in front of you...except I can't find it in Paris :( If by some weird miracle I do, they are definitely going in my next cinnamon rolls! What a great idea to add Cinnamon Crunch to the rolls. My son loves that cereal! I've never made cinnamon rolls and want to tackle that and bread in the near future. If I do manage that I'm afraid my hips and thighs will expand!!!! Just when I thought something couldn't be improved upon, YOU DID IT! Adding cinnamon cereal is an ingenuous way to get a bit of crunch in there. Do you dream these things? Or do they come to you in the light of day? home ec class was awful. we made those horrible chicken, cheese and broccoli casseroles that were so salty and veggies were cooked beyon recognition. it was those classes that started me thinking " there has to be a better way of making casseroles' lol. this. this is clever. i commend your foodie brain, emily. What a unique way to add some crunch, I like it! I cannot have these lying around, either, or they will get polished off. I love the addition of cinnamon toast crunch -fabulous! DELICIOUS!! I adore cinnamon rolls.....when I lived in England and was jobless, I'd bake them every few days. It was terrible, my flatmate and I ended up looking like cinnamon rolls we ate that many of them. OH god I want some now!! You are my new hero. 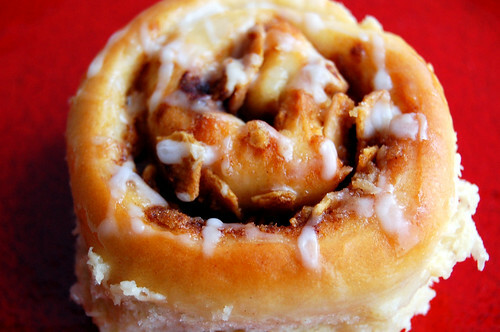 Reading your post on Cinnamon Rolls was like taking a long great look into my past. Home Ec was my starting point, too. OOOh,...my,...these rolls look so succulent & fabulous, Emily!! Your family is one lucky one!! I don't know, I think I could take you in a cinnamon roll eating contest :) Love the CTC you put in - what a great idea! 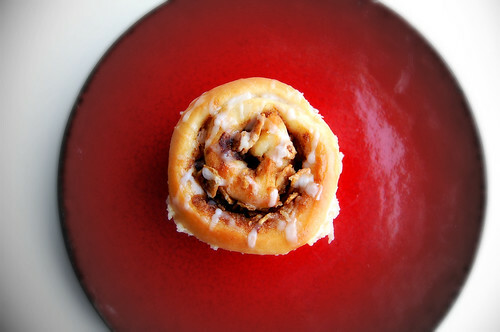 I find cinnamon rolls very hard to resist as well, unless they are from Cinnabon and I can pass them by...go figure. Your version looks delicious Emily. You might not make them a lot, but you make them GOOD! Really good. I've never tried cinnamon toast crunch. Have I been hiding under a rock?? Great idea, I agree, they are really good! This I will have to try! Ok the addition of the cinnamon toast crunch was genius!!! I love homemade cinnamon rolls but, alas, I'm like you. I couldn't leave them alone. The cinnamony crunch from the cereal is a great addition. 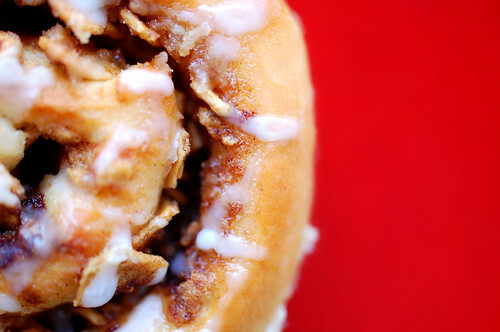 CInnamon toast crunch in a cinnamon roll makes so much sense :). Cinnamon rolls can be tough to make... yeast makes me nervous some times, and some times I just want one NOW :D.
Girl, you come up with some of the best recipes!!! These sound incredible! They look Delicious! Ah, I love me some cinnamon rolls!! I remember how 8th grade home ec class got me interested in cooking. It taught me the right way to measure and prep a recipe. I liked the cooking in 8th grade more than I liked the sewing in 6th (hand sewing) and 7th (machine - more pleasurable than hand sewing). I have no patience to sew. I love cinnamon rolls, but I don't make them either. Mostly it's because I don't have time to work with yeast. When I do have time, I shy away from sweet rolls because they're sort of a breakfast item and by the time I make them, it's way past breakfast. Yeah. I know. I can eat them any time. These look great. I think the cereal is a great substitution if you're serving these to people who don't like nuts. These look delicious - glad you gave the cinnamon roll another chance. Family skills???? OMG. Thanks everyone! Such sweet comments. Thanks for stopping by. Aunt Carol, you have the best comments. It's like ten comments in one. I want an eclair now. These look absolutely incredible. I want one right now! I've never been a big fan of cinnamon rolls. The bf LOVES them and would most definitely love these. I'll have to keep that in mind- maybe a VDay breakfast choice? Speaking of Valentine's Day- Have a great one!! Okay I have a question. If I wanted to start these at night, but bake them in the morning....would that be posible? Like to make my co-workers LOVE me? How could I do half before bed and the other half tomorrow? PLEAS! These look fabulous! I, too, cannot resist the box of cinnamon toast crunch. It's deadly! Cinnamon toast crunch cereal in a cinnamon roll? Genius ;) Thanks for sharing this mouthwatering recipe. So much for my post-vaca detox!